I saw a very curious graph when I was running the play-shares analysis for each D1 team. As I was scanning, North Carolina’s play-shares chart popped up. For those that haven’t been paying attention, Carolina was our national champion last year. They started off this campaign with three wins over UMBC, Furman, and Lehigh. Things went a little sideways starting with Hofstra in early March. Including the loss to Hofstra, the Heels went 2-5 over their next 7, culminating in a 12-8 loss against Duke. 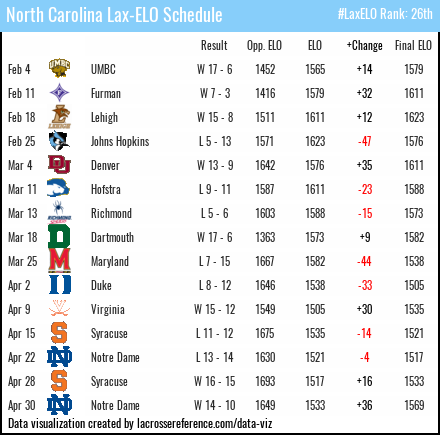 They bounced back to beat UVA, but then lost their next 2, both by a goal, to Syracuse and Notre Dame. Since then, they won the ACC tournament, with wins over Syracuse and Notre Dame. Last Sunday, the committee awarded them a first round game against the Great Danes of Albany. So needless to say, it’s been a bit of an up and down season. 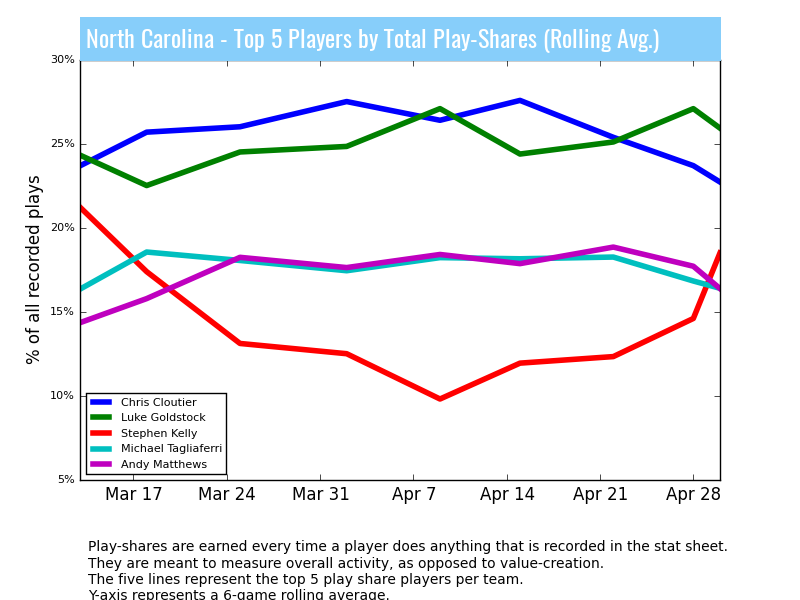 The reason I called out the UNC play shares chart is the activity pattern of one player: Stephen Kelly. His season bottomed out in the Duke game, when he won 6 out of 18 faceoffs and totaled only two ground balls. Since then, he has really rebounded, scoring 4 goals and picking up 31 ground balls (an increase of 3 GBs / game). So many things go into a team’s performance, so it would be unfair to pin their struggles or their recent successes on Kelly. But still, it’s rare that you see any chart that so closely mirrors a team’s overall fortunes. Chalk this one up to interesting statistical quirk.